Heat oven to 450°F. Place 1 pie crust in each of 2 ungreased 10-inch tart pans as directed on box for One-Crust Filled Pie. Bake 10 to 12 minutes or until crusts are golden brown. Cool 20 minutes. In each tart shell, spread 1/2 cup strawberry preserves. Top each with 1 cup sliced strawberries. Sprinkle each with 1/2 teaspoon lemon peel. Place finely chopped white chocolate in medium bowl; set aside. In 2-quart saucepan, beat egg yolks, 2 tablespoons sugar, the salt and vanilla with whisk. Beat in whipping cream and milk. Sprinkle gelatin over top of cream mixture; beat well. Cook mixture over medium heat 8 to 12 minutes, stirring constantly, until custard is thickened and smooth. Immediately pour custard filling through fine strainer into bowl with white chocolate. Stir until chocolate is melted and mixture is smooth. Pour evenly into strawberry-filled tarts. Let stand 30 minutes. Refrigerate about 1 hour or until custard is set. Gently blot any condensation on custard with paper towel. Sprinkle 1/2 cup sugar over each tart. Holding kitchen torch 3 to 4 inches from custard, caramelize sugar on custard by heating with torch about 2 minutes, moving flame continuously over sugar in circular motion, until sugar is melted and light golden brown. Or, set oven control to broil; broil tarts with tops about 6 inches from heat 5 to 6 minutes or until sugar is melted and forms a glaze. 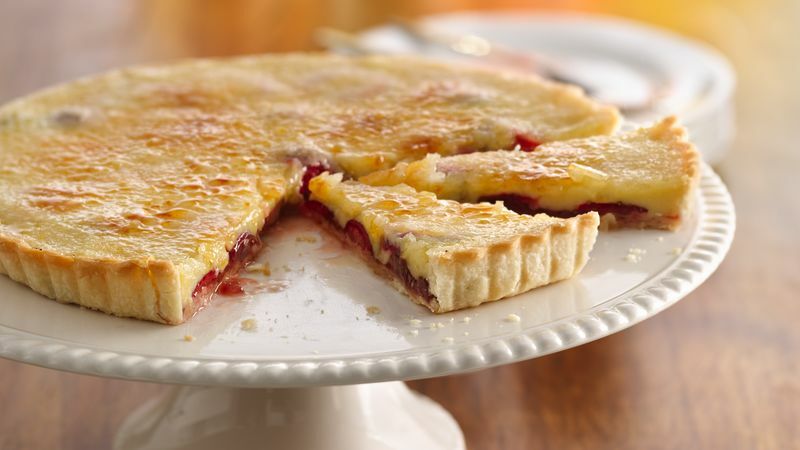 Refrigerate tarts until ready to serve. Cover and refrigerate any remaining tart.